Enjoy a time of fellowship, food, fun and great gospel music in an informal country setting. What is the Glory Barn? The Glory Barn is a place where believers gather to share God’s blessings while lifting up the wonderful name of our Lord and Savior, Jesus Christ. The main facility is a new 36′ x 48′ traditional pole barn with a concrete floor, 8′ x 36′ raised stage, professional sound system and lighting, and real bathrooms with flush toilets. There is plenty of room for parking. 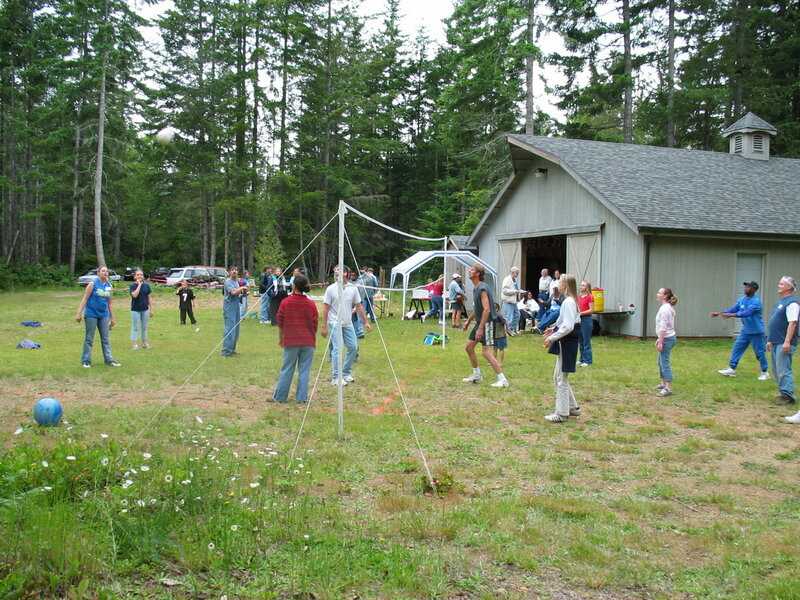 A large cleared area provides room for eating, fellowship, and playing games in a peaceful, forested country setting. We will be enjoying fellowship with other believers, singing and/or playing Christian music, eating great food, and having a super time praising the Lord. Volleyball, Badminton, and Frisbees are available for the young or young at heart. Everyone. Bring your neighbors and friends. No. Out of consideration for the hosts and other guests, please leave your pets at home. As car temperatures can get quite high during the summer, leaving a pet in your vehicle is NOT acceptable. What are the dates for Gospel Potlucks at the Glory Barn? Dates for the 2019 season are May 18, June 15, July 20, August 17, and September 7. The time for all events is from 2:00 PM to 6:00 PM. Please bring a favorite dish large enough for your family and to bless others. Fried chicken, baked beans, stuffed eggs (from your cooler, of course) and salads are always appreciated as are cookies and other desserts. Also don’t forget to bring your neighbors and friends. We provide hot dogs, coffee, and sun tea, and lemonade. We also have a complete professional sound system with microphones, guitar and bass guitar amps, electronic drums, a keyboard, and direct inputs for your electric guitar or other instruments. Make sure to bring any guitars, horns, or other instruments you would like to play. For the technically inclined: The FOH sound is provided by a tri-amped configuration of Crown amplifiers capable of sending 2700 watts RMS power into McCauley stacks with 18″ subwoofers. We use a Mackie 24 channel mixing board. 16 channels are available on stage and we offer two separate mixes to the four stage monitors. We also have free WiFi available. Will there be a worship team? The Lord always seems to provide several folks to lead our worship team. This works out great because no one is tied to the platform for the entire event. We expect many of you will bring your music and instruments so we will enjoy some great gospel jamming! We have Pandora if people are a little timid in sharing their talents. Where is the Glory Barn? We’re located at 3200 E South Island Drive, Harstine Island, Washington. Hosts are Robin and Lauryn Goodwin, phone 360 545-3377. From Shelton or Belfair, take Highway 3 to Pickering. Follow Pickering for 3.3 miles and go across the Harstine Bridge. Turn right and follow South Island Drive for 3.2 miles. The Glory Barn is on the right side, just 800 ft. before the stop sign (intersection of Harstine Island Dr.) Look for the Glory Barn sign at the driveway. Many cell phones don’t work on the island so be sure to take these directions with you when you come out.